For the former president of Venezuela, see Julián Castro. 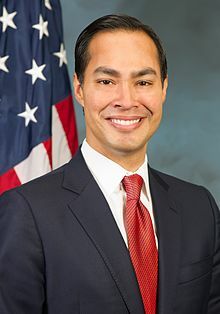 Julian Castro (/ˌhuːliˈɑːn/ hoo-lee-AHN, Spanish pronunciation: [xuˈljan]; (born September 16, 1974) is an American politician. He was the United States Secretary of Housing and Urban Development from 2014 to 2017. Before that, Castro was the Mayor of San Antonio, Texas, from 2009 to 2014. He held that office for three terms. In January 2019, Castro announced his campaign to run for President of the United States in the 2020 election. Julian Castro was born in San Antonio, Texas, to Maria "Rosie" Castro and Jessie Guzman. He is the identical twin brother of current United States Representative Joaquín Castro. His mother was a Chicana political activist who helped start the Chicano political party, La Raza Unida. She also ran for the San Antonio City Council in 1971, but she did not win. Castro once said, "My mother is probably the biggest reason that my brother and I are in public service. Growing up, she would take us to a lot of rallies and organizational meetings and other things that are very boring for an 8-, 9-, 10-year-old". Castro graduated from Thomas Jefferson High School in San Antonio in 1992. He had played football, basketball and tennis. He got an offer to play tennis at Trinity University, an NCAA Division III school in his hometown. He decided instead to go to Stanford University. He graduated from Stanford in 1996 with a bachelor's degree in political science and communications. Castro entered Harvard Law School in 1997 and graduated with a Juris Doctor law degree in 2000. Secretary Castro introducing President Obama at an event in Phoenix, Arizona in January 2015. On May 22, 2014, the White House said that Castro had been nominated by President Barack Obama to be the next Secretary of Housing and Urban Development. He was approved by the Senate on July 9, 2014, by a vote of 71-26. He took office on July 28, 2014. After the announcement, Castro has been talked about as a possible 2016 Democratic Vice Presidential nominee. On July 28, 2014, his first day in office, Castro was honored at a reception called "Celebrating Latino Cabinet Members". It was hosted by the Congressional Hispanic Caucus Institute. On December 12, 2018, Castro formed an exploratory committee for a presidential bid in the 2020 election. Exactly one month later, Castro officially launched his presidential bid at a rally in San Antonio. His brother, Congressman Joaquin Castro, introduced him at the rally. ↑ 1.0 1.1 1.2 Chafets, Zev (2010-05-09). "The Post-Hispanic Hispanic Politician". The New York Times Magazine. Retrieved 19 June 2015. ↑ Forsyth, Jim (2012-07-31). "Democratic orator Castro symbolizes Hispanic rise". Reuters. Retrieved 19 June 2015. ↑ 3.0 3.1 3.2 MacLaggan, Corrie (2012-09-03). "For San Antonio mayor, reflections of American Dream in convention speech". Reuters. Retrieved 19 June 2015. ↑ "Interview with Julian Castro". University of Texas San Antonio. 2005-11-09. Retrieved 19 June 2015. ↑ Fernandez, Manny (2012-09-03). "A Spotlight With Precedent Beckons a Mayor From Texas". The New York Times. Retrieved 19 June 2015. ↑ Baugh, Josh; Gary Martin (2012-08-26). "Democrats view Castro as rising star". San Antonio Express-News. Retrieved 19 June 2015. ↑ Garrett, Robert T. (2012-09-03). "Texan Julián Castro brings life of contrasts to Democratic convention speech". The Dallas Morning News. Retrieved 19 June 2015. ↑ Gillman, Todd J. (25 July 2014). "Julián Castro to take office Monday as Housing secretary". Dallas News. ↑ Cosman, Ben (May 23, 2014). "Obama Nominates Julián Castro for Cabinet Position, Fueling VP Speculation". The Wire. Retrieved 19 June 2015. ↑ Fuller, Jaime (May 23, 2014). "The 10 things you need to know about Julian Castro". The Washington Post. Retrieved 19 June 2015. ↑ O'Keefe, Ed. "Newly sworn-in HUD Secretary Castro gets his first D.C. party". www.washingtonpost.com. The Washington Post. Retrieved 19 June 2015. ↑ Weber, Paul (December 12, 2018). "Julian Castro Forming Presidential Exploratory Committee". Bloomberg. Retrieved December 12, 2018. ↑ Dinan, Stephen (December 12, 2018). "Julian Castro forms 2020 exploratory committee as Dem race kicks off". The Washington Times. Retrieved December 12, 2018. ↑ "Julián Castro to make announcement about 2020 plans - live updates". www.cbsnews.com. Retrieved 2019-01-12. This page was last changed on 24 February 2019, at 08:49.